What's the first thing that pops into your head when you hear the word barbecue? My guess is that it has something to do with meat and proteins. Am I right? Two of my favourite foods to grill on the BBQ are chicken and pork. There's something about digging into a perfectly grilled pork chop that makes my mouth water. However, we sometimes host guests who are vegetarian and in fact, my husband has recently made efforts to convert to a whole food diet. So what can I make on the grill that the kids will love and vegetarian guests will love, too? 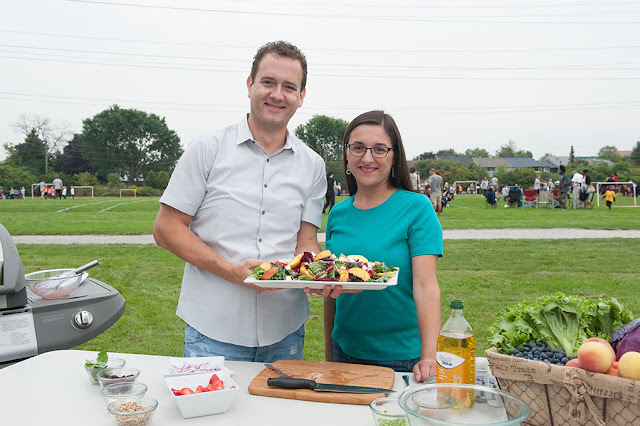 Last week, I was able to pose this very question to the talented celebrity Chef Corbin Tomaszeski on the final leg of his culinary barbecue tour across Canada. We met up in Pickering for the last Walmart tailgate of the season to try out a fabulous new recipe the whole family will enjoy - Grilled Peach Salad. In case you haven't heard, something is a-buzz in the aisles of Walmart. It carries 100% Canadian-raised Angus beef, Maple Leaf chicken, Canadian salmon and fresh produce, making it your neighbourhood spot for one-stop shopping. 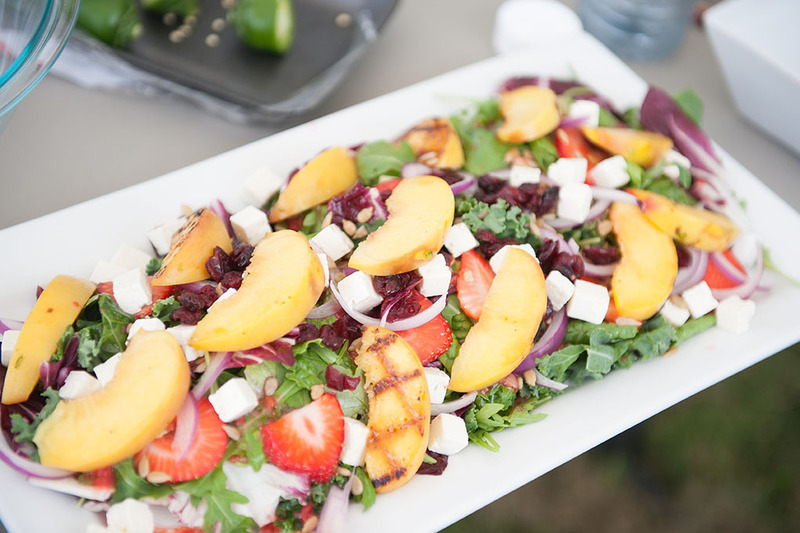 'Tis the season for peaches and let me tell you, the grilled peach salad was incredible. I had never tried peaches on the grill before and I wasn't so sure I'd like them dressed with chopped jalapeño peppers, but it was the perfect pairing between heat and sweet. And if you're worried your kids will find it too hot, Chef Corbin pointed out that the pepper itself isn't as hot as the seeds, which are really hot. Or you can easily omit the jalapeños altogether. Looking back on the tailgate, I feel like I have discovered a whole new side of Walmart. Crowds of families with their little soccer stars lined up to sample barbecued chicken, steaks, hotdogs and fresh produce from the store, many signalling their approval with a thumbs up. It only made sense for me to stop by the Walmart across the way to pick up some groceries for my next BBQ on my way home. Plus, it's reassuring that they back up their quality promise with 100% guarantee. If you're not satisfied, you can bring in your receipt for a full refund. On a final note, I'd like to thank Chef Corbin for sharing his delicious recipe and culinary skills. Disclosure: This post is sponsored by Walmart Canada, as part of the #WalmartMomCA program. In exchange for this review, I have received special perks in the form of products and/or compensation. All opinions on this blog are my own. I still haven't been able to find these lunch bags yet, I would love to get the Cars one for my hubby, he is a mechanic and I thought this would be a nice joke!! It was really quite tasty. It is! Didn't think I would like it with the jalapeño peppers but I did. Plus, Chef Corbin was so nice. He made it a lot of fun! Yup! Have you seen some of the other recipes, by the way? I want to try pizza on the BBQ! It's definitely a hearty and filling salad. Yum! Looks delicious, and not that difficult to prepare. Right? So simple and yet I would have never thought of grilling peaches on the BBQ. The salad looks delicious. I must try the grill peaches. I've never grilled a peach......you sure have me curious! !